Status: Sailed (2013-2017). sold (2017). Undoubtedly, the 2013 Pogo2 Mini Transat, Abilyn has transformed me from a racer/cruiser into a true seaman, and has unlocked resourcefulness and capabilities that I never knew I possessed. From hitting a top speed of 17.5 knots while sailing downwind in 30 knots of breeze in the 2015 Around Long Island Regatta en route to rounding Montauk only 1 hour and 15 minutes after Warrior Won (the overall 2016 Newport-Bermuda winner), to repairing Abilyn's rudders in the service entrance of my apartment building in Brooklyn, sailing and owning Abilyn has been amazingly rewarding, exciting, and invaluable. If you want to develop your skills as a fully-capable, self-reliant, offshore sailor, or just want to blast around at 15+ knots downwind with a grin from ear to ear while not spending a ton of money to do so, this is the boat for you. Since acquiring Abilyn, my co-skipper and I progressively advanced in our ability to open the potential of the Mini Transat 6.50, took her farther and faster with each season, ultimate completing our goal of safely passaging from Newport, RI to Bermuda. In 2013, we practiced on weekend afternoons and then entered the Stamford Yacht Club Vineyard Race, taking Abilyn 250 miles, out of Long Island Sound, up to Buzzards Bay, around Block Island and into the ocean, and back. In 2014, we qualified for the Bermuda 1-2 Yacht Race, with skipper Josh clocking in 206 offshore, single-handed miles over 29 hours with a 24-hour distance of 175 miles--in one of the busiest shipping channels in the world. In 2015, Abilyn was put to her paces over the course of three solid weekends of offshore sailing totaling nearly 600 miles of racing and deliveries, and hit a top speed of 17.5 knots in the 2015 Around Long Island Regatta. In 2016, we crushed the Jolly Roger class in the 50th Newport-Bermuda Race. Although technically ineligible to participate, we raced anyways, and prepared the boat according to the regatta' rigid safety requirements. After carefully analyzing a troublesome and ever-changing forecast, we set off for Bermuda after delaying our start for 24 hours while 1/3 of the official fleet dropped out. We crossed the ocean water between Castle Hill and St. George's in 5 1/2 days. Neptune marked our passage with a light-air beat to the Stream, three days of pounding through waves in 20-25 knots with two reefs in the main and one in the jib, ending with a light air beat to the finish (and Neptune also kicking my dog). In 2017, we prepped the boat steadfastly and refused to be conservative in the 2017 Vineyard Race. When the easterly rolled through the race course as night fell, bringing 30 knots of breeze and steep seas, we buckled down and rode the thunder with a reefed main and Code 5 while other boats sailed under main and jib only. We averaged 15+ knots of boat speed for 6 hours met or exceeded our top speed set in 2015--we don't know as we couldn't see s**t in the driving rain. The sights and sounds from that race were tremendous. Designed by renowned naval architect, Groupe Finot, Abilyn descends from a pedigree of successful ocean racers. "Wow!" "What is that?" According to the launch drivers in Larchmont Harbor, these are the two most common phrases they hear from people being shuttled around the harbor. In a body of water dominated by J Boats, Abilyn (USA 829)--a Pogo 2 Mini Transat boat designed by Groupe Finot and built by Open Sailing USA--gets noticed. The Pogo 2 was introduced by Groupe Finot in 2002, and has gone on to achieve tremendous success in the European Classe Mini racing circuit, securing podium finishes in many events including the fabled Mini Transat. 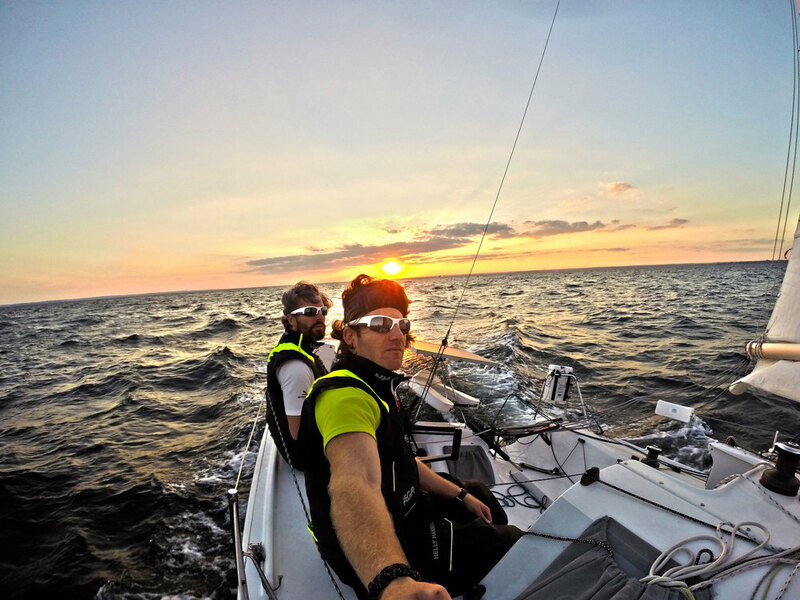 Since taking ownership of USA 829 in June 2013, Team Abilyn progressively took the boat farther and farther offshore, ultimately accomplishing our primary goal--safely completing the passage from Newport, RI to Bermuda. We did what we came to do, and it feels good. Mainsail - 279 sq. ft.
Genoa - 193 sq. ft.
Jib - 129 sq. ft.
Spinnaker - 805 sq. ft.
temperature) - spare transducer incl. Main and jibs stored down below in-season on PVC pipes. Blue Performance cabin bag organizers. Looking brand new after a good cleaning after the 2017 Vineyard Race, where Abilyn secured 3rd place in PHRF-doublehanded and 11th overall in PHRF (out of 35 boats). Not bad for a 21-foot boat. The view from the HH66 catamaran, Nala, as she passes the diminutive Abilyn at the start of the 2017 Vineyard Race. Here's a video that gives a pretty good taste of what we've been doing for the past five seasons, and what you can expect if you're intrepid enough to helm Abilyn on her next adventure--that is to say, a cost-effective platform to develop as a shorthanded sailor, and a ton of fun. Intending to "race" the 21-foot Mini Transat Abilyn on June 17, 2016, alongside the official Newport-Bermuda Race fleet, we had a difficult decision to make. Sail to Bermuda and potentially face 40+ knots in the Gulf Stream, wind against current. Or go home. We went for it. This is our journey. The sights and sounds aboard Abilyn as she competes in the 2017 Vineyard Race, securing 3rd in PHRF-doublehanded and 11th in PHRF overall (out of 35 boats). Not bad for a 21-foot boat. Delivery highlights from downwind leg out to Block Island. 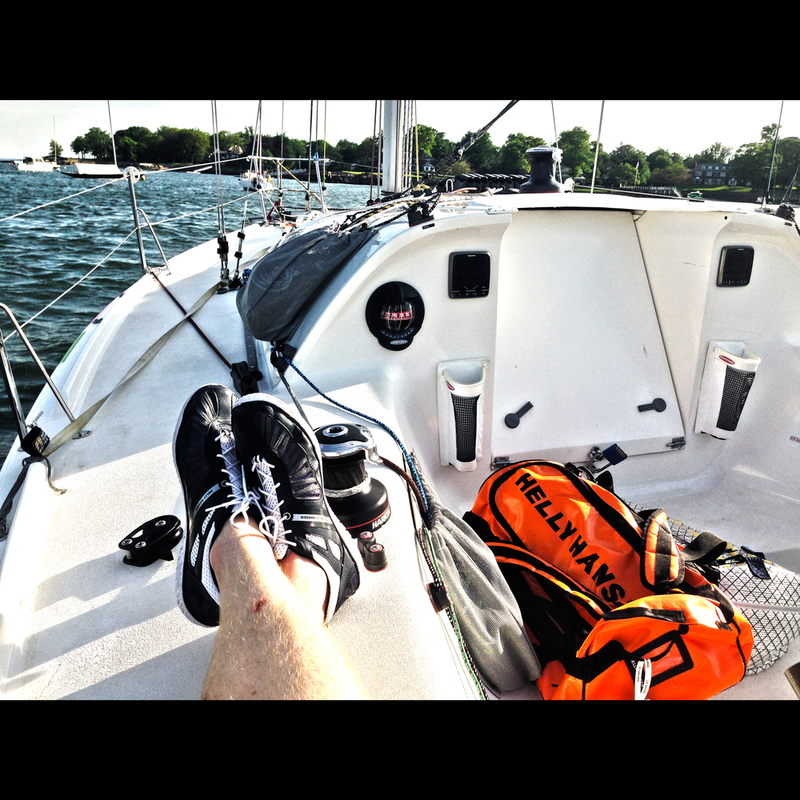 90 miles in 11 hours in a 21-foot boat. 15-18 knots of breeze from the southwest. Sister ship Artemis Offshore downwind practice in 20 knots. Night mission on Long Island Sound: Autopilot testing and boat handling. Jerome Sammarcelli aboard sister ship Team Open Sailing in the 2012 Single-Handed Transpac. Sailing under full main and Code 5 (with storm jib as staysail) while qualifying for the Bermuda 1-2. 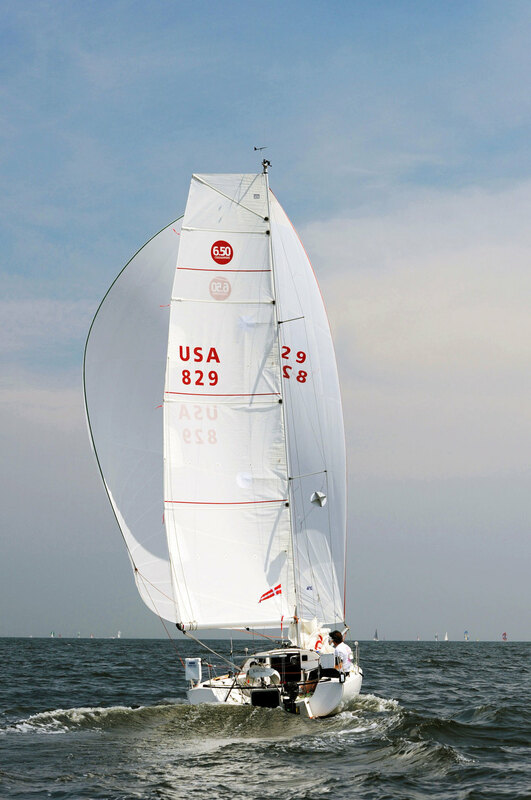 Recap of 59th Larchmont YC Edlu regatta. Moderate conditions followed by 30-knot squall. Went out in 12-22 knots to fly a kite and test out the GoPro sprit pole cam. A 4-ton hoist and 7mm SK78 Dyneema gives us an easy way out of the water.